The picture doesn’t do this meal justice. We were surprised by how flavoursome simple food like this can be, the chicken is just popped onto a few herbs and lightly seasoned and then steamed over vegetables. It’s a nice change to eat food au natural with no marinades and extra flavours. 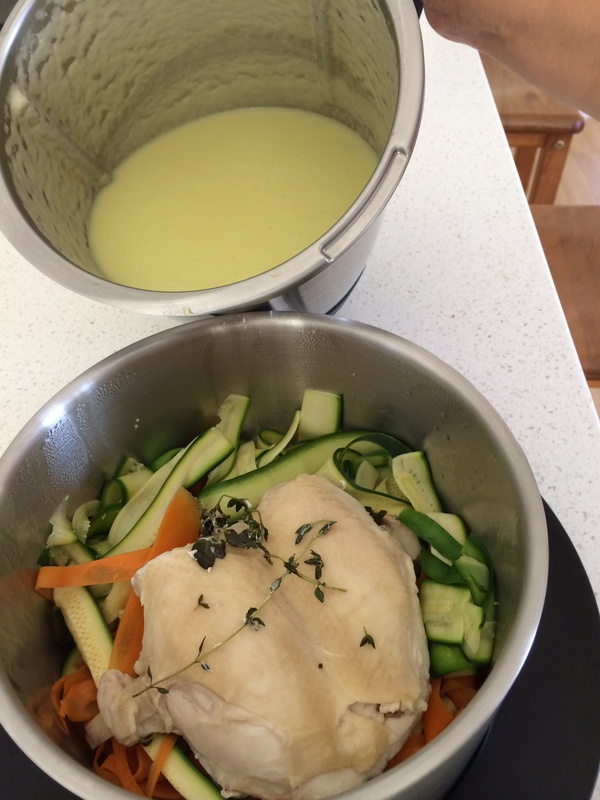 From another guided thermomix recipe, chicken velouté is a lovely meal for two reasons 1) steaming the chicken and vegetables makes this meal very light, perfect healthy gluten free summer food and 2) two courses are cooked at the same time in the thermomix within 20 minutes. Leek and potato soup cooks in the tmx bowl while the chicken and courgette and carrot tagliatelle steam in the Varoma tray above. Still can’t get over how clever this machine is, no stirring, no standing over the stove. The only tricky part is peeling the vegetables into ribbons without cutting your fingers. And the best thing is the soup and the vegetables catch any flavour from the chicken that drips from steaming into the bowl and Varoma dish. The chicken and vegetables were supposed to be topped with a creme fraiche and Dijon mustard dressing but we didn’t have any creme fraiche. We were all just happy to dip the chicken and vegetables into the soup. Left the skin on the chicken to keep it even more moist and removed it before slicing. Comments like “I really like the vegetable noodles” and “can we have this again” make this a rewarding meal that was easy to put together. Normally my kids have an aversion to cooked carrots but not this way. The leek and potato soup is delicious, so creamy and smooth, possibly mine and miss 8’s favourite thermomix soup. The only alteration I made was to cook the onions and garlic for 4 minutes instead of 3 to eliminate any raw onion flavour. Also pre cooked this meal earlier in the day and just resteamed for 10 minutes to reheat. The recipe makes a large quantity and there’s plenty leftover for lunch tomorrow. And the kids even snacked on it for afternoon tea. Another big tick for a thermomix guided recipe. Nb if you want to cook a larger quantity of leek and potato soup, like when all we want is soup for dinner, try one of these recipes from the community. Both are fantastic and commented another post in this blog, under the heading Bacon leek and potato soup.